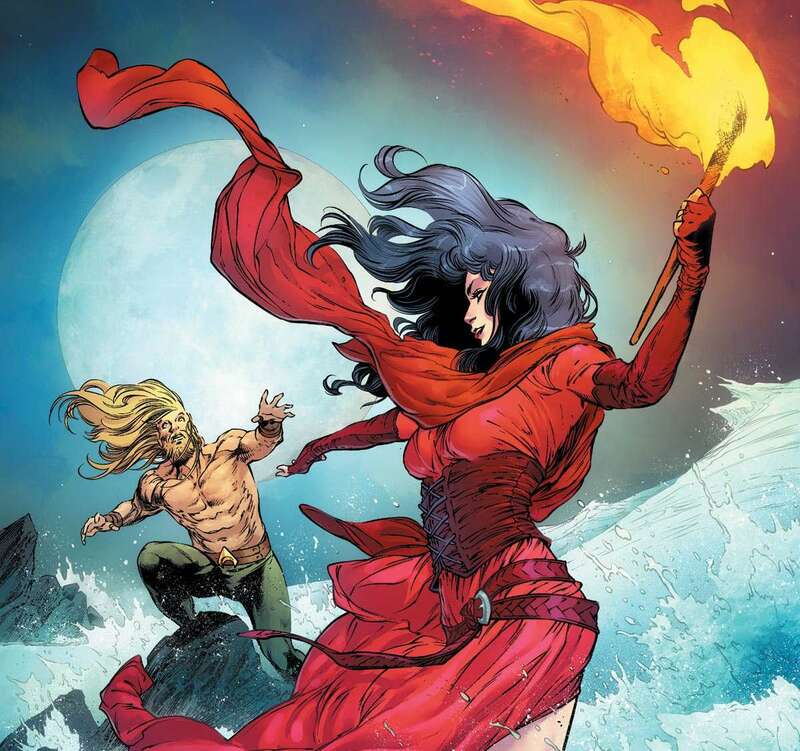 Aquaman #44 review: The Sea Gods – AiPT! The true identities of the Sea Gods are revealed! Aquaman has been many things over the years. A superhero. A king. An ambassador of Atlantis. But under Kelly Sue DeConnick and Robson Rocha, the character returns to elements and roots he hasn’t touched upon in some time. Alongside Daniel Henriques, Sunny Gho and Clayton Cowles, the team has compellingly refocused the Aquaman title to explore new depths in new contexts. Moving the character from the realm of the traditional superhero or the world of Atlantean politics, they’ve taken him into a realm of myth. Stranded on a metaphysical isle, in the village of Unspoken Water, Arthur Curry, the Aquaman, is presumed dead. And to add to that, he no longer remembers who he even is or ever was. But he has a chance to do so in the form of a quest. Deliver a woman of the village named Callie to her vengeful divine mother and make peace and in doing so, claim his memory as reward. The tale begins with out first look at Mera in the new run, as she’s reminiscing about Arthur. Drawn in gorgeous detail by Rocha, with marvelous inks that accentuate the penciller’s strengths by Henriques, it’s a beautiful rendition of the character. Rocha, with his fluid and smooth style, is a great pick for a book dealing with water and all that it is and beyond that, his handling of textures is fantastic. Mera’s hair is drawn with great care and doesn’t look or feel like any other material in the page, much like her dress comes across as being made of distinct material. Add Gho’s lovely colors to the mix, which instantly brighten up and give context to the imagery in a wonderful way, setting the scenes perfectly and granting them life and you’ve got a winning combo. Whenever oranges, blues or greens are involved Gho’s work comes to life and gleams with grandeur. Mera’s design here for this new era is worth praising as well. It’s striking, distinct and well designed, fitting its underwater locale and Mera’s current status as Queen. She looks more akin to classic fantasy royalty than a traditional superhero, which is, once again, part of the intent here. The book is moving the world and story of Arthur into the realm of myth and pure fantasy, with even the main story being framed as an epic quest with a great reward for the lost hero on a mythic isle. The issue reveals to us that suitors across the seven seas have assembled for her hand in marriage and it’s at this moment that Mera thinks of Arthur, crafting a construct of him with her Aquakinesis abilities. In captions with incredibly romantic words of remembrance, she mourns the man she loved and she still loves. From there on we cut back to the village of Unspoken Water, as Arthur, going by Andy (or Aurasio, if you’re Callie), is helping out the old woman and ancient sea goddess Wee with her firewood. After a game of riddles and a discussion on the complications of restoring his memories, Wee departs, asking that he join her and the other villagers at the shore at sunset. In the meantime, Arthur heads off to meet Callie at her home to discuss the proposition of taking her off to meet her mother, the ancient vengeful sea-goddess Namma. Callie remains cross with Arthur and the villagers, feeling that despite warning her of her mother all her life, they’re throwing her to Namma at the first sign of trouble with no regard for her own wishes. Arthur counters her by reminder her that the ocean she loves so deeply is dying and yet nobody truly wants to acknowledge it, for they are powerless to do anything about it. Daring her to confront her powerlessness and still take action, Arthur leaves. Then we’re treated to what is easily the standout sequence of the issue. Arthur and Callie join the villagers at sunset and witness their ceremony over a bonfire, utilizing the firewood Arthur helped Wee collect. Lighting a torch from it, Wee begins to hold it close to each of the villagers, including herself. And in doing so, in the flame, we are shown the true forms of each one, as they, including we, identify themselves and speak of their nature. What is revealed is a massive assembly of water deities spanning the entire universal mythology, from Aztec mythology to even Hindu mythology. They’re all here, collectively marooned by the great ocean they’re tied to, for reasons that yet remain unclear. It’s an epic, awe-inspiring moment, witnessing this wild assortment of mythological oceanic figures. And it’s also one that best encapsulates the fundamental appeal of this new take on the franchise. After all this, Wee asks Arthur to step forward and place some firewood of his own in the fire as an offering. When he does, the flames erupt green, pushing him back. The sea gods then proceed to begin a rain ritual, which is answered by lightning and a downpour. And that’s when things get terrifying for Arthur. The gods drag him by force into the force and drown him. He struggles, trying to hold his breath, but it’s only when he fails that he realizes the truth: he can breathe underwater. His eyes glow green as he utilizes his power once more and so the issue leaves us. It’s certainly no accident and nor is it unintentional that such heavy focus has been put on water and the ocean and what that really means to Aquaman. DeConnick has discussed her view of the character and how the team is tapping into the truly primal and elemental nature of the character and it shows. Even him breathing in water, his simplest ability, is made special here and it’s no small deal, because really, Aquaman’s powers are nothing small. We take them for granted, but there’s a majesty and universal appeal to them, that is often ignored. Aquaman #44 is a fantastic build from the previous installment of the run and is a great second issue to the new era of the character. DeConnick writes charming and mythic characters with lovely dialogue, which maestro Clayton Cowles brings to life in expert fashion. The art team of Rocha, Henriques and Gho consistently knock it out of the park and have build their own visual aesthetic for the Aquaman book that is delightful to see. This is a team that’s truly made the title and character their own and it’s a blast to read. It’s additive, it’s clever and mostly, it’s truly fresh.